Prominent & Leading Manufacturer from Una, we offer ppr pipe welding machine. It is an ordinary PPR Pipe Welding Machine, suitable in welding various pipes, like PPR pies, PE pipes and so on. It is equipped 6 moulds of the size within 20 mm, 25 mm, 32 mm, 40 mm, 50 mm, 63 mm, especially, all the moulds are covered with American famous coatings Teflon, to protect the plastic pipes from adhering, it also equipped some install tools. 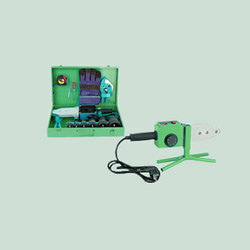 Looking for PPR Welding Machine ?